Here is a really awesome product that many women (and men, I’m sure) will find very useful. It’s battery powered heated blanket. Unlike traditional electric blankets that are heated using your home electricity, this one is operated by batteries. There is no cord that will tie you to the wall. 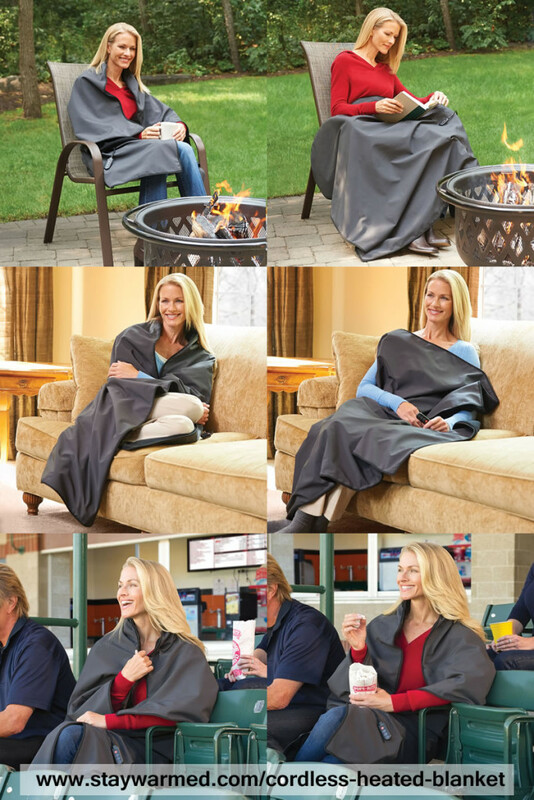 With this blanket, you can move freely and use it whenever and wherever you need it. For example, at a stadium or when camping. In addition to being extremely comfortable and cozy, this cordless blanket is also energy efficient. Because it provides so much warmth, you can turn down heating in your home at night! This reduction will save you money on energy costs. A wireless heated blanket that will keep you warm both inside and outside and that will save you money on electricity bill! Outstanding! Where can I buy it? Do you delivery it to Spain? Buy here: http://www.staywarmed.com/cordless-heated-blanket. It can be shipped to Spain. Can you ship this to India?